371 Marlborough is located on the north side of Marlborough, between Hereford and Massachusetts Avenue, with 369 Marlborough to the east and 373 Marlborough to the west. 371 Marlborough was built in 1879-1880 by Vinal & Dodge, masons, for building contractor George Wheatland, Jr., for speculative sale. It was one of three contiguous houses (369-371-373 Marlborough) built at the same time and one of twelve contiguous houses (369-371-373-375-377-379-381-383-385-387-389-391 Marlborough) built for George Wheatland, Jr., in 1879-1881. He is shown as the owner of 369-371-373 Marlborough on the original building permit application for the three houses, dated December 4, 1879 (one application for three houses). Click here for an index to the deeds for 371 Marlborough, and click here for further information on the land on the north side of Marlborough between Hereford and Massachusetts Avenue. George Wheatland, Jr., subsequently built the twelve houses at 369-391 Marlborough on 276 feet of the combined 280.58 foot parcel (the surplus 4 feet to the east and the 0.58 feet to the west were sold by his father to others). As the houses were completed, William D. Pickman and the estate of William P. Fay (who had died in March of 1879) transferred their two-thirds interest to George Wheatland, Sr. He subsequently sold the houses to individual purchasers. On October 18, 1880, 371 Marlborough was purchased from George Wheatland, Sr., by Elliott Russell, an accountant. He and his wife, Sarah L. (Tinkham) Russell, made it their home. Sarah Russell’s mother, Sarah (Lincoln) Tinkham, the widow of Spencer Tinkham, lived with them. They all previously had lived at 377 Beacon. Sarah Tinkham died in July of 1886. The Russells continued to live at 371 Marlborough during the 1888-1889 winter season, but moved thereafter to an apartment at 407 Marlborough, where he died in January of 1894. In his will, he left 371 Marlborough to his wife during her lifetime and then to their only child, Catherine. Sarah Russell died in April of 1917; Catherine Russell continued to own 371 Marlborough and lease it to others until 1925. By the 1889-1890 winter season, 371 Marlborough was the home of architect Charles Allerton Coolidge and his wife, Julia (Shepley) Coolidge. They had married in October of 1889, and 371 Marlborough probably was their first home together. Prior to their marriage, he had lived at 114 Commonwealth with his parents, David Hill Coolidge and Isabella (Shurtleff) Coolidge. The Coolidges continued to live at 371 Marlborough during the 1891-1892 season, and then moved to Chicago. By the 1892-1893 winter season, 371 Marlborough was the home Mary Louisa (McCulloh) Mayer Upham, the widow of Henry Christian Mayer and Henry Upham. She previously had lived at 354 Marlborough, the home of her daughter, Mary Abby (Mayer) Greene, widow of Dr. John Singleton Copley Greene. In 1894, Mary Upham was joined at 371 Marlborough by Mary Amory Greene and her sister, Margaret Greene. They previously had lived at 432 Marlborough. They were sisters of Mary Upham’s deceased son-in-law, John Singleton Copley Greene. Mary Amory Greene was an artist. They had moved from 371 Marlborough by 1895 and by 1900 were living in New York City. Mary Upham continued to live at 371 Marlborough during the 1905-1906 winter season, but moved thereafter to 142 Marlborough. 371 Marlborough was not listed in the 1907 Blue Book. By the 1907-1908 winter season, it was the home of lawyer Arthur Hazard Dakin and his wife, Emma Frances (Sahler) Dakin. They previously had lived at 39 Chestnut They also maintained a home in Amherst. They continued to live at 371 Marlborough during the 1909-1910 season, after which they made Amherst their home. By the 1910-1911 winter season, 371 Marlborough was the home of Charles Pelham Greenough and his wife, Margaret Bliss (Perkins) Greenough. They previously had lived at The Torrington at 384 Commonwealth. He was a stock and bond broker, and was known as Charles Pelham Greenough, 2nd, to avoid confusion with his uncle of the same name. 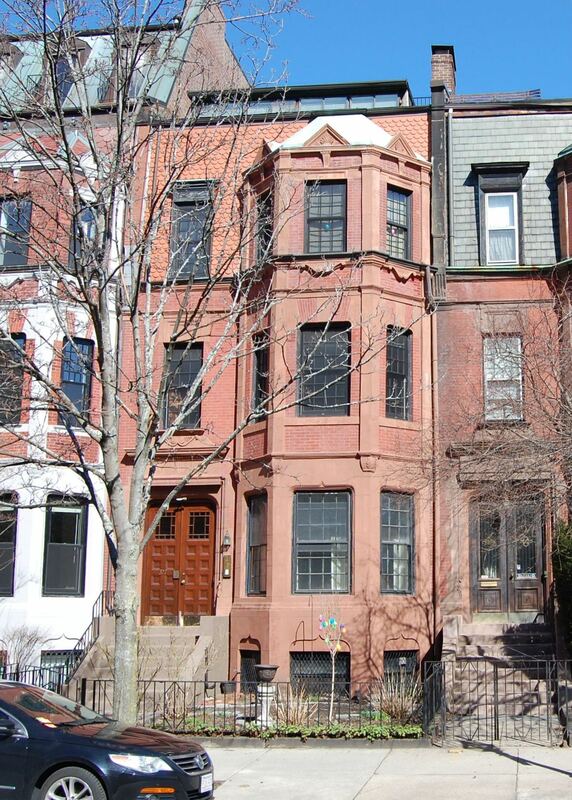 They continued to live at 371 Marlborough during the 1913-1914 season, but moved thereafter to Brookline. During the 1914-1915 winter season, 371 Marlborough was the home of Thomas Barbour and his wife, Rosamond (Pierce) Barbour. They previously had lived in Brookline. Thomas Barbour was curator of the Harvard Museum of Comparative Zoology. He later would become the Alexander Agassiz Professor of Zoology at Harvard and, in 1927, would be named director of the museum. He undertook numerous zoological expeditions throughout the world on behalf of the museum. On March 11, 1915, the house was damaged by a basement fire. The Barbours moved soon thereafter to 12 Hereford. By the 1915-1916 winter season, 371 Marlborough was the home of Mrs. Laura (Henshaw) McAllister, the wife of Hall McAllister. She previously had lived at The Graffam at 330 Dartmouth. Laura McAllister was a singing teacher. Hall McAllister was an attorney who had interrupted his career in the early 1900s to become an actor, but later resumed practicing law with the US Department of the Interior. They were separated. Their two children, Francis Hall McAllister and Louise McAllister, lived with her. Louise McAllister married in August of 1917 to Nevil Ford, a stockbroker. After their marriage, they moved to an apartment at 407 Marlborough. 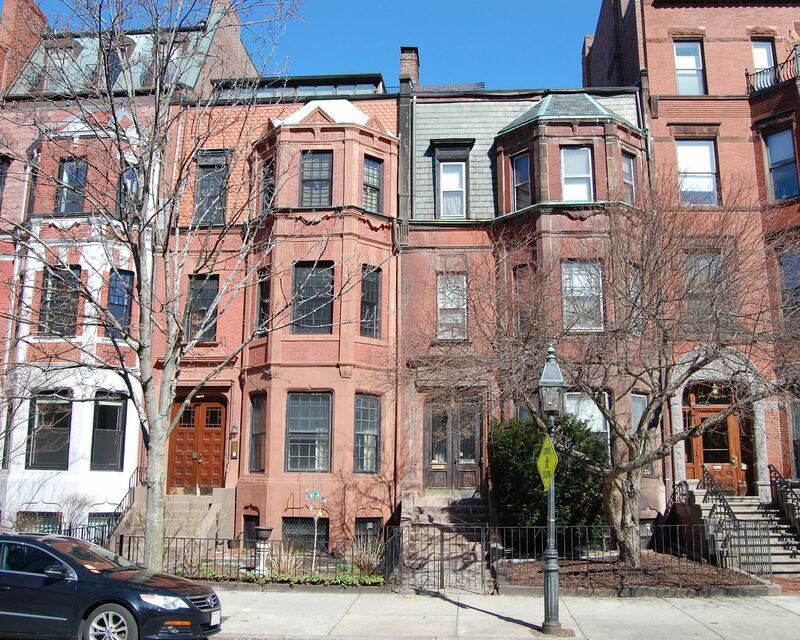 Laura McAllister and Francis McAllister continued to live at 371 Marlborough during the 1917-1918 season, but moved thereafter to The Torrington at 384 Commonwealth. By the 1919-1920 winter season, 371 Marlborough was the home of Norreys Jephson O’Conor and his wife, Grace Edith (Corson) O’Conor. They previously had lived in Cambridge. He was an author, poet, playwright, and lecturer on Irish literature and subjects. They continued to live at 371 Marlborough during the 1921-1922 season, but moved thereafter to Grinnell, Iowa. By the 1922-1923 winter season, 371 Marlborough was the home of William R. Hedge and his wife, Alice Paine (Nowell) Hedge. They previously had lived in an apartment at 409 Marlborough. They also maintained a home in Plymouth. William Hedge was president of the Boston Insurance Company. On February 2, 1925, Alice Hedge purchased 371 Marlborough from Catherine Russell. William Hedge died in April of 1943. Alice Hedge continued to live at 371 Marlborough until about 1950. Their two unmarried daughters, Susan and Alice, lived with her. On February 27, 1950, 371 Marlborough was purchased from Alice Hedge by Marchant Waterson Eldridge. He and his wife, Alice Ruth (called Ruth) (Thomas) Eldridge, made it their home. They previously had lived at 1984 Commonwealth. On November 21, 1951, he transferred the property into both of their names. Marchant Eldridge was a personnel officer with New England Mutual Life Insurance. Ruth Eldridge’s parents, Arthur Dunlop Thomas and Julia A. (Raike) Thomas, lived with them. They previously had lived at 7 Follen. He died in December of 1950. Julia Thomas continued to live at 271 Marlborough with the Elidridges. In December of 1952, Marchant Eldridge filed for (and subsequently received) permission to convert the property from a single-family dwelling into five apartments. 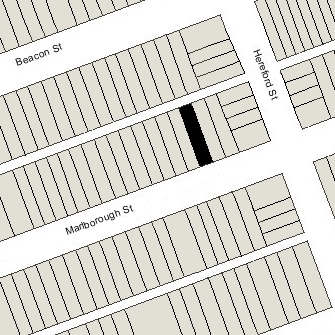 By 1953, Marchant Eldridge’s father, Samuel Waterson Eldridge, also was living at 371 Marlborough. He previously had been a lodger at 384 Marlborough. He was a bank examiner for the Commonwealth of Massachusetts. Marchant and Ruth Eldridge continued to live at 371 Marlborough until about 1957, when they moved to Marblehead. Julia Thomas probably moved with them. Samuel Eldridge continued to live in one of the apartments at 371 Marlborough until his death in August of 1967. In July of 1978, Marchant and Ruth Eldridge filed for (and subsequently received) permission to reduce the number of apartments from five to four, and also to install a dormer at the front of the top floor (the dormer extends across the entire width of the house). On October 19, 1978, the Eldridges converted the property into four condominium units, the 371 Marlborough Condominium.